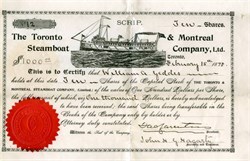 Beautiful RARE certificate #12 from the Toronto & Montreal Steamboat Company, Ltd. issued in 1898. This historic document has an ornate border around it with a vignette of the steamboat, Persia and has an embossed red corporate seal attached to it face. This item has the hand signatures of the Company's President, James Carruthers and Secretary, John Henry Grasett Hagarty. � THE TORONTO AND MONTREAL STEAMBOAT COMPANY � (LIMITED). Incorporated 13th March, 1895. � �- Amount of capital stock, $24,000. Number of shares, 240.�Amount of each share, $100. Corporate Members:-�James Carruthers, merchant; Wilmot de Loui Matthews, grain merchant ; John Irvine Davidson, wholesale grocer ; John Henry Grasett Hagarty, vessel agent ; Samuel Crangle, master mariner ; Michael McLaughlin, miller ; and James Albert Proctor, Robert Davy Perry and Charles Peter, executors of the last will and testament of Alexander Mortimer Smith and William Walker Keighley, trading under the name of Smith & Keighley, all of the city of Toronto, Ont, wholesale grocers. Irvine Davidson and John Henry Grasett Hagarty. Chief Place of Business :�-City of Toronto, Ont.
' __ or substitute for the said steamship ; the conveying and carrying therein freight and cargoes of all descriptions, as well as passengers and other traflic and the towing who, and wrecking on the waters of the great lakes, the St. Lawrence and all connecting rivers, lakes or canals, and on the high seas, and the buying and selling of and in cargoes and merchandise for freight hire or otherwise. The acquiring,leasing, building, repairing, maintaining, owning, holding, and operating all wharves, elevators and warehouses, in any part of Canada deemed necessary. BENJAMIN SULTE, F.R.S.C. DR. C. E. FRYER, M.A., PH.D.
James Carruthers, one of the most prominent representatives of the grain trade in the Dominion of Canada, with which line of business he has been closely identified all his life, is well and favorably known over the breadth 'of this continent, in Montreal especially and also in the great grain centres of the West. His long experience has gained for him an efficiency that has made the firm of James Carruthers & Company, of which he is the President, the leading representatives in this line. Mr. Carruthers was born in Toronto in 1853, a son of George Andrew Carruthers and Janet Carruthers. His educational training was obtained in the city of Toronto. He commenced his business career in the office of Mr. T. C. Chisholm, grain merchant, Toronto, where he acquired consider- able knowledge in the vocation he chose to follow in life, and afterwards became a partner in the well-known firm of Crane and Baird. He re- mained with this firm for some time, then feeling confident that he had gained sufficient knowledge of the grain trade to start business on his own account, this soon became an accomplished fact, for he established offices in Montreal, Toronto and Winnipeg. Success has met him at every turn, due to his keen business aptitude. He readily comprehends intricate business situations and brings to the solution of complex business problems clear judgment and ready discrimination. Mr. Carruthers has become an active factor in the management of various corporations besides that of his own business. He is President of the Toronto and Montreal Steamboat Company, of the Hiram L. Piper Com- pany, of the United Supply and Contracting Company, and of the Mont- real and Lake Erie Steamboat Company, He is also on the directorate of the Dominion Bank of Canada, of the Winnipeg Elevator Company, of the Eoyal Marine Insurance Company, and of the St. Lawrence and Chicago Steam Navigation Company. He is an ex-President of the Corn Exchange, and a member of the Montreal Board of Trade. Mr. Carruthers is also a governor of the General Hospital and the Western Hospital, Montreal. He is a genial, companionable and entertaining gentleman, and association with him means pleasure, expansion and elevation. He is married and has three sons, one of whom is dead. The other two sons are holding responsible positions in the Dominion. In religious faith he is a Presbyterian, and his political allegiance is given to the Liberal party.